I procrastinated for almost a week after I finished knitting the Market Bag (based on the pattern in Alternknits, one of my favorite knitting books and one of the few you really need to get if you don’t have it). The reason was that I planned on following the instructions in the book for making handles out of plastic tubing, and I wasn’t quite sure it was going to work. I love how the bag turned out, and I was just the teensiest bit afraid of ruining it. Last night, I decided it was time to go ahead and finish it — in the wee hours where no children were around to distract me. The bag is knit mostly from Peace Fleece, which felts nicely, although I still need to shave off the fuzz. I changed the pattern to create a roll down top, so I would have a very sturdy fabric to attach the handles to. I’m going to use this bag at our weekly farmers market, and wanted to make sure it would hold up. The handles are mad of plastic tubing, a brilliant idea from the book. I took some twill tape and dyed it to match the lavender yarn, using Procion MX dyes. Then, I stamped on both sides of the tapes, so that it reads "knit & purl" across the handles. I made holes in the plastic tubing and sewed it to the double thickness of felt created by the rolled over edge. To cover the ends of the handles, I sewed on vintage mother of purl buttons. Voila. I can’t wait to use it. That looks great. I love the handles, what a brilliant touch. Enjoy using it. 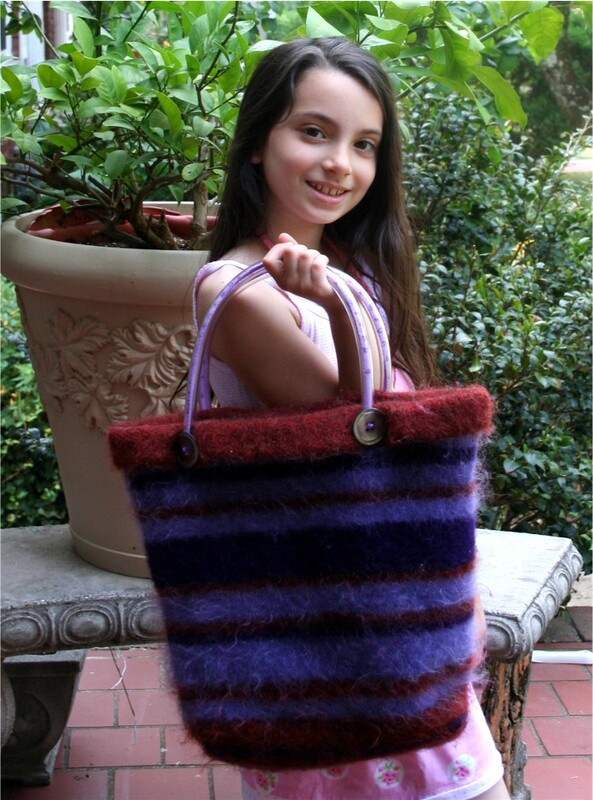 The market bag looks beautiful – as does the model. I bet you’ll get a lot of envious glances at the Farmer’s Market. WOW!!!!! I love your bag Joyce. The colors are wonderful. I bet you can’t wait to use this. Awesome! “Mother of Purl” – spoken like a true knitter! LOL! ps. love the kn1t & purl! Love Love Love your bag Joyce! Nice bag!! I love the handles especially! I love the bag, such unique handles! Very nice indeed – Congratulations !! Beautiful bag – you are very clever! Joyce, I LOVE your market bag! What a great model holding it! I’m going right now to Amazon to order the book. I definitely need to make this. And the handles are so awesome! I love how you stamped words to show through – fabulous idea! What a great looking bag (and model!) – love the color combinations. In fact you have inspired me to pull out an “almost finished” bag I have been knitting forever and will work on completing and felting it this week. Purple and lime green ~ can’t wait to see how it felts! What a beautiful bag! You’ve inspired me to go and finish one I have been knitting since the Ice Age 🙂 Thanks for the little boost!